PeopleNews Network: These Photos Of Adventurous Nigerian Women Should Inspire You To Jump Out Of Your Comfort Zones! These Photos Of Adventurous Nigerian Women Should Inspire You To Jump Out Of Your Comfort Zones! Vacations are needed stress relievers. Taking a trip to a different environment from the one you are normally used to can greatly help to blow off steam from work and domestic pressures. Going on a vacation does not necessarily have to be expensive. You can take a trip to the next state from you, or even to a different part of the town you live in. 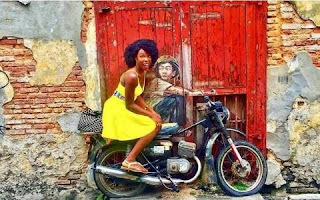 Today, we bring you photos of Nigerian women who have traveled all over the world; starting from tourist locations in Nigeria, to various cities in other African countries, to several places in other continents. The following photos were gotten from the Instagram page of @naijagirlstraveltoo, whose aim is to inspire Nigerian ladies to explore the world.